The Afghanistan peace framework is an important step in ending America's longest war. This war is now fought by some who weren't alive on 9/11, and it has cost more than the Marshall Plan and over 2,000 U.S. troops. Americans want the war to end. Our original, justified objective of defeating al-Qaeda evolved into fighting the Taliban and democratizing Afghanistan. America should always stand for human rights and freedom, but not through endless military intervention. Our strategy goes beyond counterterrorism and is unwinnable. The Taliban know their land and threaten 70 percent of Afghanistan - more than before the 2009 "surge" or at any point since 9/11. Our troops shouldn't be mired in taking land for the Afghan military, providing force protection and fighting a permanent insurgency. If anything, prolonged overseas military presence breeds radicalization. Responsibly withdrawing makes us safer. But what if the Taliban steamroll the Afghan government and then harbor terrorists? Preventing that outcome doesn't require a permanent U.S. troop presence. Deterrence works. The Taliban should understand that the United States will use overwhelming force again if they harbor terrorists who directly threaten our homeland. Moreover, other "ungoverned territories" exist where terrorists can operate. There, we conduct counterterrorism from the air without troop deployment. OUR VIEW: Will Taliban talks repeat 'peace with honor' of Vietnam? We should continue supporting the Afghan government financially and diplomatically after leaving and include them in the peace process. The Afghans must eventually earn domestic legitimacy themselves, though. China has avoided this "graveyard of empires," hasn't fought in 40 years, and instead invests domestically. When determining how we pay for investments such as $80 billion for universal broadband, let's remember we will spend $90 billion in Afghanistan over the next two years. The biggest threat to democracy isn't the Taliban; it's staying economically competitive with authoritarian superpowers like China. 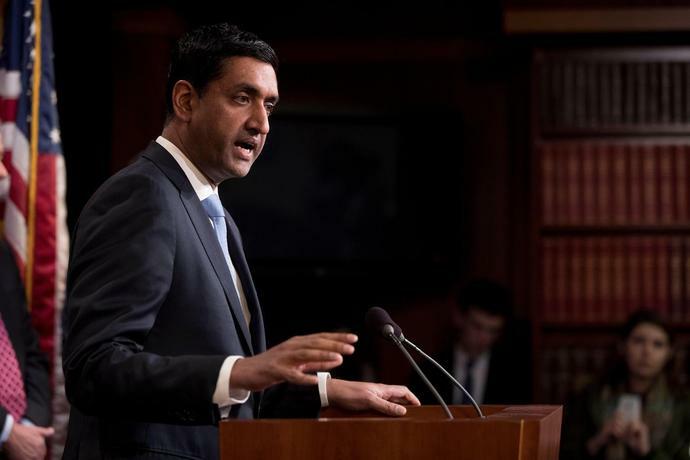 Rep. Ro Khanna, D-Calif., serves on the House Armed Services Committee. ISIS-K, the terror group&apos;s offshoot in Afghanistan, represents the top threat to western countries, according to a senior intelligence official.